As the 2016 Republican National Convention, a.k.a. 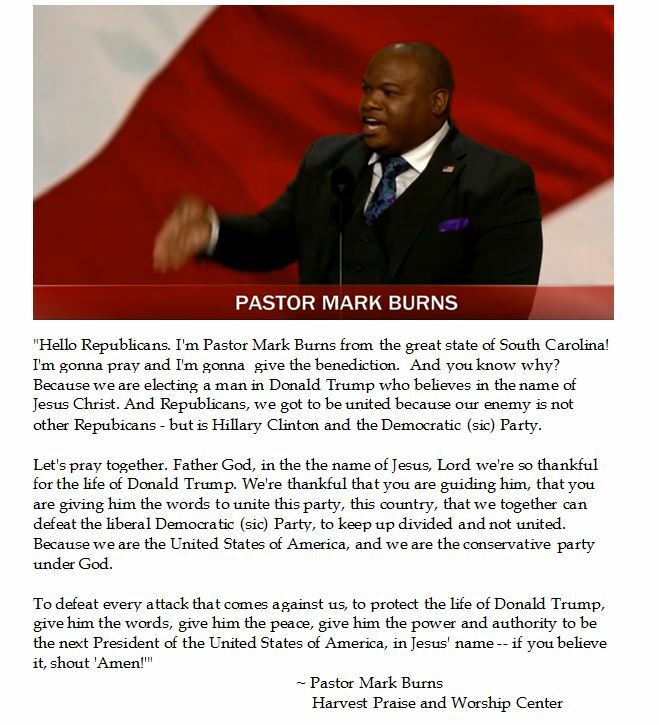 "The Trump Show", kicked off in Cleveland, it was centered by a "special" prayer from Pastor Mark Burns. Ordinarily, invocations are placid, pro-forma prayers which remind attendees of Divine Providence. But this is the Trump Show. Well, the Trump Show promised that is was going to have star power and entertainment, so the choice of a televangelist for a Benediction is not surprising. However, the content of Burns' polemic prayer deserves some discernment. The prayer seems to elevate Donald Trump into an ascending super saint, which seems ironic considering Trump's ambivalent approach to religion. What seemed remarkable was a prayer which cast Hillary Clinton and the Democrat Party as the enemy. Put in a theological framework, they are the Devil incarnate. There is no rationale given as to why liberal's are not following an orthodox path for the polity, just that they are the enemy. Four years ago, the Catholic Archbishop of New York Timothy Cardinal Dolan gave an ecumenical benediction to the GOP which extolled the virtues of America( freedom and liberty), challenged the faithful to remember all Americans, and humbly asked God for guidance and protection of Governor Romney and Representative Ryan. It should be noted that Cardinal Dolan also gave the closing benediction at the 2012 Democrat Convention, in which he challenged those gathered about religious liberty and abortion as he prayed for those gathered. Perhaps it is a difference in approach and theological grounding, but Pastor Burns commanded God to give Donald Trump authority to become President and defeat the enemy rather than beseeching Divine Providence for wisdom and humility to lead our Nation. Despite Pastor Burns' benediction, hopes that the Trump Show will spur party unity needs more than hype and a prayer. Aside from ephemeral politics, this prayer epitomizes how so many born agains hopped on the Trump Train while regular church going evangelicals fret about a leader who publicly lacks humility, evokes values which seem counter to Christianity and seems to use his associations with faith communities rather than walking in faith on the campaign trail.